Making healthy lifestyle choices is a decision that in theory, seems easy to achieve. Eat vegetables, exercise, cut back on sugar; this is all useful information. So then, why is it that healthy eating and exercise are such difficult habits to maintain? 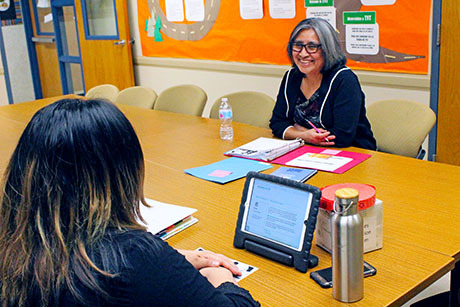 “It’s because we don’t make smart goals,” explains Maria Silva, Manager of St. Vincent de Paul’s Family Wellness program. Smart goals are a part of the action plan system that the Family Wellness program uses to help individuals identify obstacles that will prevent them from sticking to their resolutions. “Smart goals are specific, measureable, attainable and timely. If your goal is to lose weight, a smart goal will help you decide how to achieve that weight loss,” Maria continues. “This process allows our students to think through their daily routines and decide how their new goal will fit into their current schedule. If you are not a morning person, don’t work out on the morning—instead save your exercise for the evening, when you are more motivated.” Maria’s advice is to, “Examine your day and write down a plan. This alone is scientifically proven to increase the success rate of achieving that goal.” And she’s right, the science supports her statement—and so does Matilde Orso. SVdP’s Family Wellness Center offers classes that focus on prevention and management of chronic diseases, like obesity. These programs offer participants an educational foundation of good nutrition, physical activity and overall wellness. Individuals, families and children learn to make lifestyle changes with the support of their community and our staff. It was here that Matilde found the help she needed. According to National Institute on Aging, healthy dietary guidelines suggest that each day individuals consume between 5 to 10 ounces of grains, 5 to 7 ounces of protein and no more that 3 cups of dairy foods (preferably fat-free). An easy way to remember these guidelines is by using USDA’s “Choose MyPlate” program. 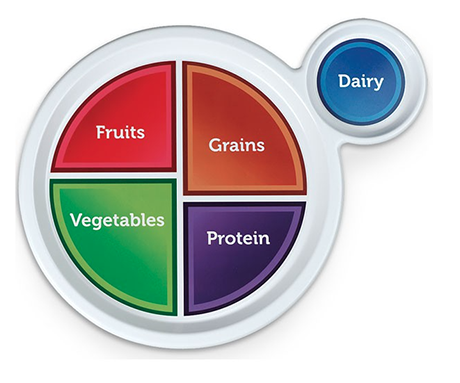 This portion control plate indicates how much of each food group an individual should consume during each meal. 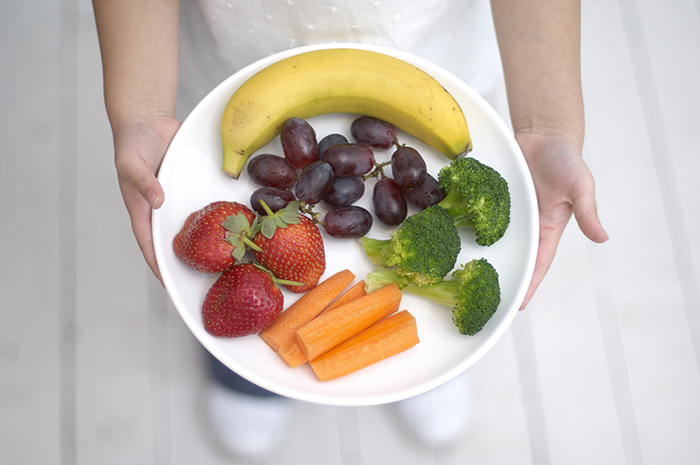 It makes healthy eating accessible; and is the preferred method on instruction in SVdP’s Family Wellness Center. For Matilde incorporating nutritious vegetables was one her biggest obstacles. 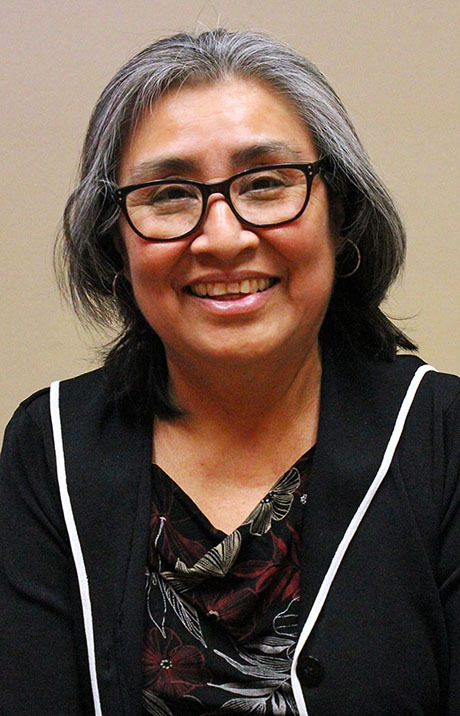 She consumed starchy rice and beans with most meals, not realizing that those items were adding to her weight. However, with some coaching and her smart goals in place, Matilde started to experiment with a variety of vegetables she had never cooked before. “I tried cooking eggplant,” Matilde says, laughing. “And I don’t fry things anymore.” Matilde also contributes her success to her adding exercise into her daily routine. Due to a back injury, exercise has always been an activity that she had struggled to incorporate. She found that walking for 20 minutes, five days a week, left her feeling healthy and invigorated. Matilde’s journey, like so many of ours, has not been easy. Some days healthy eating is not always an option and on other days getting to the gym is out of the question. The Family Wellness Program teaches that healthy habits are not achieved overnight, but rather with perseverance and a proper support system. For Matilde, being smart about obstacles that could deter her from achieving her goals, lead to her success. By modifying her diet and adding an exercise she could participate in, Matilde improved her overall health and wellness. So, if her success story teaches us anything, it’s that smart goals and small changes are the keys to living a healthier life.